Perfect rice dish that would taste great with chicken, fish, and pork! This is a good combination with Sergio's carnitas recipes. I substituted pablano peppers for the green peppers, which added a little spice. I also used a large can of black beans and added a cup of chicken broth since there was not enough stock in the black bean can to cook the rice. This works fine if you don't think ahead to soak black beans overnight. It came out delicious! 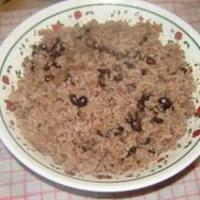 I've loved this simple cuban rice dish since the first time I had it at the Cafe Unica in Union City, New Jersey. This recipe is authentic. Delicious.